About 3% of women and one-tenth that number of men have suffered from bulimia or binge eating disorder at some time. But binge eating in milder forms is much more common and so are attempts to compensate for it. According to one estimate, more than two-thirds of college women indulge in an eating binge at least once a year, and more than 15% have deliberately induced vomiting or used laxatives afterward. 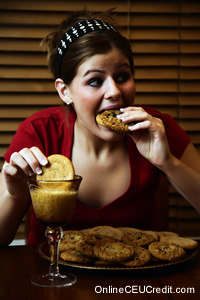 Eating binges often accompany other psychiatric disorders. It is no surprise that one of these is anorexia nervosa, the self-starvation syndrome. About 40% of people with severe bulimia have a history of anorexia, and many suffer from a mixture of anorexic and bulimic symptoms. Other disorders associated with binge eating and bulimia are borderline personality, alcoholism, and especially depression. More than half of people with binge eating disorder have a history of major depression. Eating disorders probably have many causes. Twin studies indicate a genetic vulnerability --the matching rate for bulimia in identical twins is 23%, in fraternal twins 9%. Bulimic women are more likely than average to be overweight and to have overweight parents. Cultural attitudes toward food, beauty, and health are obviously important, although it's not clear how they play out in individual cases. Beyond that, no causes of bulimia and binge eating have been confirmed, although many are proposed --from peer pressure to sexual anxieties, family conflict, problem parenting, and child abuse. The most carefully studied treatment for bulimia and binge eating disorder is cognitive behavioral therapy, conducted in 12-20 weekly sessions. The aim is to help patients rethink their eating and exercise habits and find other ways to cope with situations and feelings that induce binges. They are shown how to examine self-defeating beliefs, such as the fear that a slight weight gain is obvious to everyone or the illusion that their value as people depends on their looks. They are given nutritional counseling and taught how to correct distorted impressions of body shape, and they practice ways to prevent relapse. Recent meta-analyses of controlled studies indicate that cognitive behavioral therapy for bulimia and related problems is more effective than being put on a waiting list (no treatment), and also more effective than supportive and supportive-expressive forms of psychotherapy, but not superior to other psychotherapies. One study suggests that patients given a guided self-help manual get the same results with fewer sessions of cognitive behavioral therapy. Cognitive behavioral therapy is sometimes designed to include the behavioral technique of exposure and response prevention. That means allowing patients to eat until they are nauseated and then asking them to concentrate on the discomfort and write down their thoughts and feelings. Exposure and response prevention is a standard treatment for compulsive rituals, but so far it has not proved effective in preventing binge eating. Although it has not been studied as closely as cognitive behavioral therapy, interpersonal therapy is usually found to be just as helpful for people with eating disorders. In this form of therapy, the patient and therapist concentrate on the patient's personal relationships, emphasizing one of four themes: loss, disputes, life transitions, and isolation or loneliness. In one study, patients receiving interpersonal therapy were more likely than those receiving cognitive behavioral therapy to continue to improve after the end of treatment. Group therapy has often been used for bulimia. In addition to a setting for the presentation of advice and information or the application of cognitive-behavioral methods, it can provide a sense of belonging and a source of friendships. Group members see that they are not alone and help themselves by helping others. A 40-study meta-analysis with an average follow-up of one year suggests that group therapy for bulimia is moderately effective. Besides professional group therapy, mutual aid groups are available, many of them associated with Overeaters Anonymous, an organization modeled on Alcoholics Anonymous. Family therapy is sometimes recommended for children and others who are living with their parents. The family can be educated about the problem and try to resolve conflicts that may be contributing to it. There are no controlled studies of family therapy for bulimia and binge eating. Most people with binge eating problems think they are seriously overweight or in danger of becoming seriously overweight. Many, especially those with binge eating disorder, are obese. Among obese people seeking weight loss treatment, a large percentage are also binge eaters (and often depressed as well). This situation creates a dilemma that has provoked a controversy. Many therapists who treat bulimia and binge eating doubt that dieting for weight loss is compatible with stopping the binges and purges. Some of them, noting that anorexia is often the forerunner of bulimia, have concluded that dieting is part of the problem rather than part of the solution. According to a widely held theory, each person's body has a weight-regulating mechanism governed by hormones that control appetite and metabolic rate (energy expenditure). If you try to subvert this mechanism by strict dieting, the body will resist by slowing metabolism and increasing appetite. A common result is intense preoccupation with food, followed by bingeing and purging that cause anxiety and depression, leading to further attempts at dieting, further binge eating, and further anxious depression. Physicians concerned mainly about the growing problem of obesity and its many serious medical consequences reject this argument. They believe that a weight control program including scheduled exercise, education, and nutritional counseling is effective for obese patients with a binge eating problem. At least one study has found that a diet of 1,200-1,500 calories a day is as effective as cognitive behavioral therapy in reducing binge eating and the associated depression and distorted body image. But critics point out that most patients in dieting studies regain any lost weight within 5 years. Fortunately, by contrast, the outcome of bulimia is often fairly good. In a 1997 meta-analysis, researchers found an average recovery rate of 50% after periods of 6 months to 5 years in patients treated for bulimia. Women with other psychiatric disorders, especially alcoholism, were least likely to recover. In a recent prospective study, Australian researchers found that after 5 years, 74% of bulimic patients and 78% of patients with other eating disorders (apart from anorexia) were free of symptoms. Treatment did not seem to improve the outcome, but it was likely that treated patients had more serious and intractable problems to begin with. It would be better, of course, if bulimia could be prevented in the first place. Parents may be able to help. One psychologist, exaggerating to make a point, has said that if a 12-year-old says she wants to go on a diet, her parents should be just as worried as if she had said she wanted birth control pills. It is a sign of a problem that needs attention, whether it is an unrealistic view of her looks or unhappiness about some other aspect of her life. Parents are advised to ask not about food but about the child's or adolescent's emotional state. They should not use food as a reward or a punishment, and should examine their own attitudes toward food and body shape. For example, they should not talk about their weight in the child's presence. And they should be critical of the contradictory and anxiety-provoking messages conveyed by the mass media-- both the food advertisements and the models of beauty. Here and there, prevention programs have been introduced. In Norway, for instance, an eating disorders prevention curriculum has been instituted in secondary schools. School staff or health professionals have been required to attend training sessions in which they learn about eating disorders and the application of cognitive behavioral techniques. The data on such programs are limited -- studies are mostly brief and the results uncertain. It appears that education about eating disorders, as now conducted, has more effect on attitudes than on behavior. There are many prospects for research. More studies of non-Western countries are needed to learn how eating disorders are affected by culture. Also needed are long-term prospective studies in which large groups are identified before developing symptoms. The complex relationships among biology, upbringing, and culture in the onset of eating disorders, and the roles of dieting and obesity in maintaining the disorders, can only be clarified by finding out which members of the group develop the disorder. The relationship between eating problems and other psychiatric conditions, especially depression, needs to be determined, partly so that treatments can be adapted for different combinations of symptoms. Other forms of psychotherapy besides cognitive behavioral therapy must be studied more carefully. Learning more about people who recover from binge eating and bulimia may help distinguish between biological abnormalities that are causes of eating disorders and those that are consequences. More effective treatments may result from a better understanding of the hormonal systems that regulate body weight. Prevention programs designed to increase public awareness may work better if they are integrated with programs for preventing obesity-related diseases. Ultimately, though, the problem may be a social as well as an individual one, and in that case nothing less than broader cultural and institutional changes will be needed to solve it. - Harvard Mental Health Letter; Treatment of bulimia and binge eating; Jul 2002; Vol. 19; Issue 1. The preceding section contained information about the treatment of bulimia and binge eating. Write three case study examples regarding how you might use the content of this section in your practice. What is the focus of interpersonal therapy with a bulimic or binge eating client? Record the letter of the correct answer the CEU Answer Booklet.